This is one of the first full-scale examinations of the Department of Defense’s “Better Buying Power” initiatives that were launched in 2010 by current Secretary of Defense Ashton Carter in his previous position as Under Secretary of Defense for Acquisition, Technology, and Logistics. The goal of the initiative is to get more for each dollar DOD spends on buying goods and services. Three iterations of Better Buying Power have been issued, most recently in April 2015 when Better Buying Power 3.0 was announced. For each core initiative, the authors examine the motivation for the initiative, experience to date, and the challenges facing each. 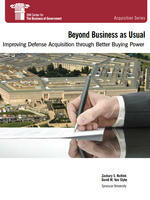 The report sets forth eight lessons learned about implementing acquisition reform. We hope that all government leaders who are interested in improving acquisition in their organization will find this report useful and informative. Listen to our podcast with the authors. Read an article about this report in Inside Defense. Read an article about the report in Federal Computer Week.